The diaphragm is a huge muscle that rests horizontally across the base of the rib cage. Imagine an oval shaped dinner plate or bowl, turned upside down, and inside your lower rib cage. The diaphragm is connected in the front, along the sides of your lower ribs, and also along the back. On inhalation, the diaphragm muscle contracts, and pulls downward, such that the ribs flare out slightly, and pulls the bottom of the lungs downward to bring in air. On exhalation, this releases and the air goes out. With the Yoga practice of deep diaphragmatic breathing, the space just below the breast bone, at the upper abdomen pushes in slightly so as to exhale more completely. When the diaphragm muscle contracts, it pulls the bottom of the lungs downward, causing them to fill, while the ribs flare outward to the sides. The chest and abdominal muscles are not used in diaphragmatic breathing. Conscious diaphragmatic breathing is extremely relaxing to the autonomic nervous system and is essential preparation for deep meditation. When the diaphragm is used for breathing, there is no motion in the lower abdomen, and the upper chest remains still. However, many of us lead stress-filled lives, and learn bad breathing habits, using the abdomen and the chest. This creates further tension that leaves us in a vicious cycle of mental chatter driving bad breathing and physical tightness, and the bad breathing, in turn, causing trouble to the mind. While there is no motion of the upper chest and lower abdomen in proper diaphragmatic breathing, it may take some time and practice to attain this motionlessness, and to have the motion occur only in the diaphragm area itself. It is important to note that modern medicine has finally acknowledged what the yogis have known for thousands of years, that the breath is intimately connected to the autonomic nervous system and the mind. Even some hospitals and medical establishments are now willing to train people in breath regulation and diaphragmatic breathing. The two keys to proper diaphragmatic breathing are: 1) to receive proper training, and 2) to then practice every day. To set aside a few minutes in the early morning and a few minutes in the evening to sit quietly and consciously breathe diaphragmatically is a very useful thing to do. To practice diaphragmatic breathing a few more times during the day is even more beneficial. Breathe with the diaphragm, allowing the ribs to slightly flare out to the sides, while the shoulders, upper chest and abdomen remain motionless. Breathe smoothly, allowing no jerkiness or irregularities to disturb the steady flow. Breathe slowly, but within your comfortable capacity, not straining or getting insufficient air. Breathe at a comfortable depth; deeply, not shallow, but also not exaggerating the depth. Allow breath to flow continuously, with no pause allowed between the breaths, either between inhalation and exhalation, or between exhalation and inhalation. Breathe evenly, so that exhalation and inhalation are of the same duration. Once that is comfortable, allow the exhalation to be twice as long as the inhalation during the practice time. First, be aware of the motion of the diaphragm, allowing the upper chest and the abdomen to be still. Then, after a few minutes, bring your attention to the feel of the air moving in the nostrils (still doing diaphragmatic breathing). It is the cognitive sense of touch. Continue to breath smoothly and slowly, with no jerkiness or pauses. Continue this for several more minutes. This practice can be done as a complete breathing practice itself, or as a part of a complete meditation practice, where the subtler meditation follows the diaphragmatic breathing practice. While it should be self-evident, it needs to be pointed out that the human body is designed to use the nose for breathing, not the mouth. Unfortunately, there is a lot of advice circulated that one should breathe through the mouth. Noses are meant for breathing. Proper diaphragmatic breathing is the foundation training in preparation for the balancing and vigorous breathing practices. The benefits of learning and practicing diaphragmatic breathing are immense. Without it, it is unlikely that one will progress in meditation as a spiritual pursuit. Awareness of the feel of the breath at the bridge of the nostrils is a very simple, straightforward, and highly effective meditation practice. It is the cognitive sense of touch, as the air is literally felt to come and go. To allow the breath to slow on exhalation is a further refinement, whereby exhalation is as much as twice the duration as inhalation. For even finer experience, allow there to be no pause between the breaths, with exhalation gently flowing into inhalation, and inhalation gently flowing into exhalation. This is excellent preparation for the subtler, more advanced practices. The biggest single problem in learning proper diaphragmatic breathing is in knowing where the diaphragm is located. The pictures below should help you find the diaphragm. It is common to see both long-time students and teachers of hatha Yoga and diaphragmatic breathing actively moving the muscles in the abdominal (belly), thoracic (chest), and clavicle (the horizontal bones at the shoulders) regions and calling these muscle movements diaphragmatic breathing. Belly breathing, chest breathing, and shoulder breathing are simply not diaphragmatic breathing (people often report shoulder or neck pains which come from using the neck and shoulder muscles some 20,000 times a day in this way for which they are not designed). One of the main problems with all forms of breath training, whether for meditation or clinical reasons, seems to be a misunderstanding of the precise location of the diaphragm. If one does not know where to find the diaphragm, it is difficult to train oneself or others in proper diaphragmatic breathing. NOT the same as the abdomen or the chest. It would be of tremendous benefit if the many teachers of hatha Yoga and yogic breathing, along with respiratory therapists, occupational therapists, counselors, psychologists, physicians, and other professionals would learn and teach proper diaphragmatic breathing. It is of tremendous benefit not only to seekers of deep meditation for spiritual awakening or Self-Realization, but also those only wishing to "manage" their inner stress. It is important to note that speaking of diaphragmatic breathing does not negate the many balancing and invigorating practices, which can be quite useful. Rather, proper diaphragmatic breathing forms a foundation for those other practices. 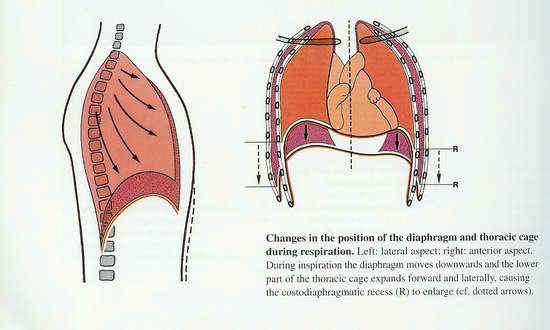 The horizontal purple area in the right-hand picture below (Figure 1) is the location of the diaphragm. In the left-hand picture, it is the horizontal red area. On inhalation the diaphragm contracts and moves down, as the rib cage (lower thoracic cage) expands slightly outward to the sides (laterally). As the diaphragm moves down with inhalation, the lower thoracic cage (chest) also moves forward, but only very slightly. Upper chest does not move: With diaphragmatic breathing the upper thoracic cage (chest) does NOT move either upward or outward. With proper diaphragmatic breathing, the upper thoracic cage (chest) remains motionless. Some will say that the upper chest muscles move slightly, but this is not true; such motion is an indication of insufficient training and practice. Lower abdomen does not move: With diaphragmatic breathing the lower abdomen also does NOT move outward. Many people teach that the abdomen moves outward, but that comes from abdominal breathing, NOT from proper diaphragmatic breathing. On exhalation the diaphragm releases, and the lower thoracic cage (chest) naturally comes inward from the sides and front. Once again, there is no motion whatsoever in the upper thoracic cage (chest) or the abdomen when one is properly doing diaphragmatic breathing. With conscious, practiced diaphragmatic breathing, both the upper chest and the abdomen are still. Along with practicing steady, smooth breathing, without any pause between breaths, there comes a natural quieting of the mind and the nervous system. The diaphragm is the large, oval-shaped object (item #20) at the bottom of this photo (Figure 2). The view in this photo is from the right side of the body. The right side of the rib cage, the right lung and the pleura (lining of the lung) have been removed for this view. Notice that the heart (#19) is resting on top of the diaphragm. This is one of the visible ways we can easily see how diaphragmatic breathing has such an intimate relation with the functioning of the heart. 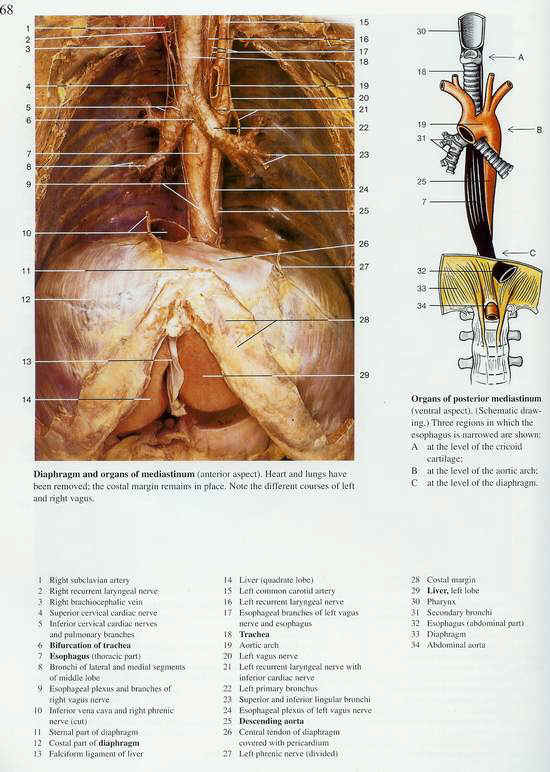 It is also interesting to note that the right vagus nerve is visible at the top of the photo (#13), as this nerve is critical in physical relaxation of the autonomic nervous system (the right vagus nerve is also visible in Figure 6). 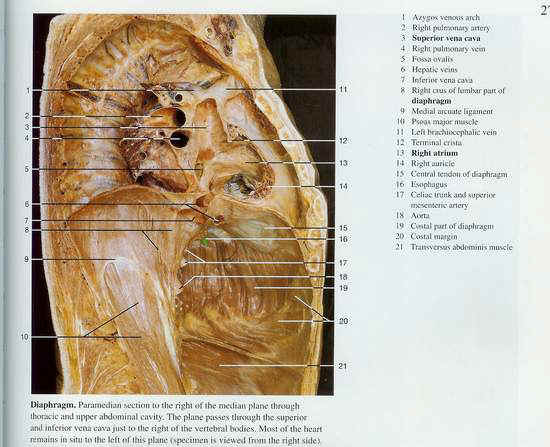 This view (Figure 3) is of the right side of the body, with only a portion of the right side having been removed. 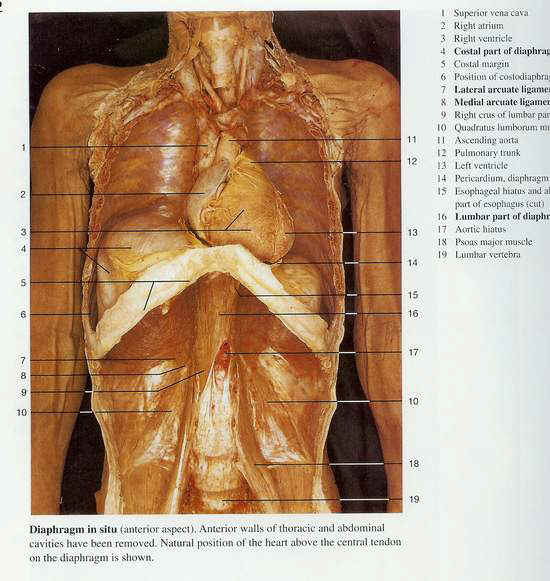 Part of the muscle tissue of the diaphragm is visible at the left side of the picture (#8) and another part of the diaphragm is visible at the right side of the picture (#20). 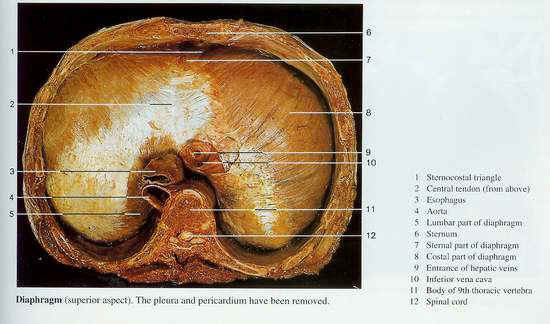 The diaphragm is quite visible (#23) in this left view of the body (Figure 4). Notice the heart (#7, #10) immediately above the diaphragm. 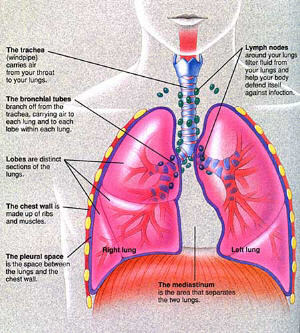 The left lung would rest immediately on top of the diaphragm, although it has been removed for this picture. It is clear how the diaphragm pulling down on contraction (during proper diaphragmatic breathing) would cause inhalation by pulling the bottom of the lung downward. Exhalation would come by the release of that contraction and the resulting return of the diaphragm to a more upper, dome-like shape. The bottom of the lung would then naturally rise, allowing exhalation. 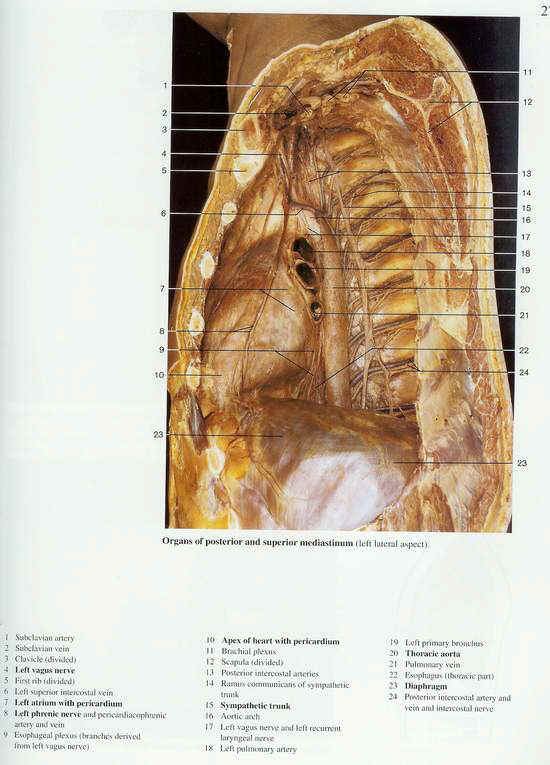 The right side of the diaphragm (which is the left side of the photo; #4) is shown in this picture (Figure 5). The heart is visible positioned on top of the diaphragm (#2, #3, #10, #12, #13). Notice the white inverted-v shaped bone (#5), which is the lower edge of the rib cage, defining the lower part (costal margin) of the thorax (chest). The rest of the rib cage has been removed for viewing, as have the lungs (it may appear that lungs are in the photo, but that is actually the back of the abdominal cavity). It is especially important to notice how the diaphragm is in alignment with the bottom of the rib cage, but actually is tucked nicely up into the chest cavity. With inhalation during diaphragmatic breathing, the diaphragm muscle contracts, and pulls downward, which also draws the bottom of the lungs downward, causing them to fill with air. When the contraction of the diaphragm is released, the diaphragm naturally returns up into the thoracic cavity. In this view (Figure 6), the heart and lungs have been removed. The dome shape of the diaphragm (#11, #12, #26) is quite clear in this photo. 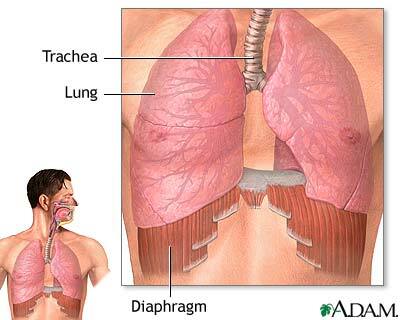 As the muscle tissue of the diaphragm contracts during proper diaphragmatic breathing, it draws itself downward, which also pulls the bottom of the lungs downward, causing inhalation. On relaxation of the diaphragm there is the a natural exhalation, as the diaphragm returns to its more dome-like shape. As mentioned above (Figure 2), the right vagus nerve is critical in physical relaxation of the autonomic nervous system; it is also visible in the photo below (#9). 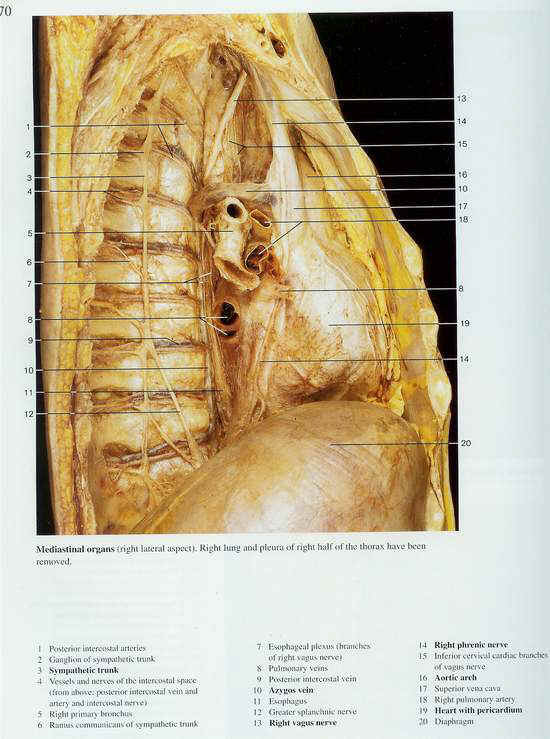 The diaphragm (#7 and #8) is seen here (Figure 7) to completely fill the chest cavity from left to right, and from front to back. The upper chest has been removed just above the diaphragm. The view is from above, looking downward at the diaphragm. Notice the striations in the muscle tissue and how these would contract during diaphragmatic breathing in such a way as to expand the chest cavity slightly, allowing the diaphragm to gently pull the bottom of the lungs downward, bringing air inward for exhalation.